"It is not a shortcut". Thus proclaims the information sheet at Mid Caples hut. On the map Steele Creek looks like a nice shortcut between the Caples and Greenstone valleys, but it has a reputation of being difficult and demanding. The treasurer of the local Deerstalkers Association had similarly warned me not to underestimate Steele Creek. To top it off I met a young Scotsman who did the route ten years ago and swore "Never again!" Now, after having just completed the trip again he vowed "Definitely never again!" Of course, the more I heard the more I wanted to go over Steele Creek. From Upper Caples hut the 850m climb is steep and relentless, but straight forward. I was glad to be going up this section rather than descending. The bushline was reached in a tad under two hours and I paused to slather on sunblock. From the bushline the route is marked with warratahs but the foot track quickly became obscure. It began by following thin scree channels through low scrub before edging along tussock southwest toward the pass. A damp ledge lead to the broad pass at 1359m. Below me was revealed the vista of Steele Creek running nearly due south to the Greenstone valley. 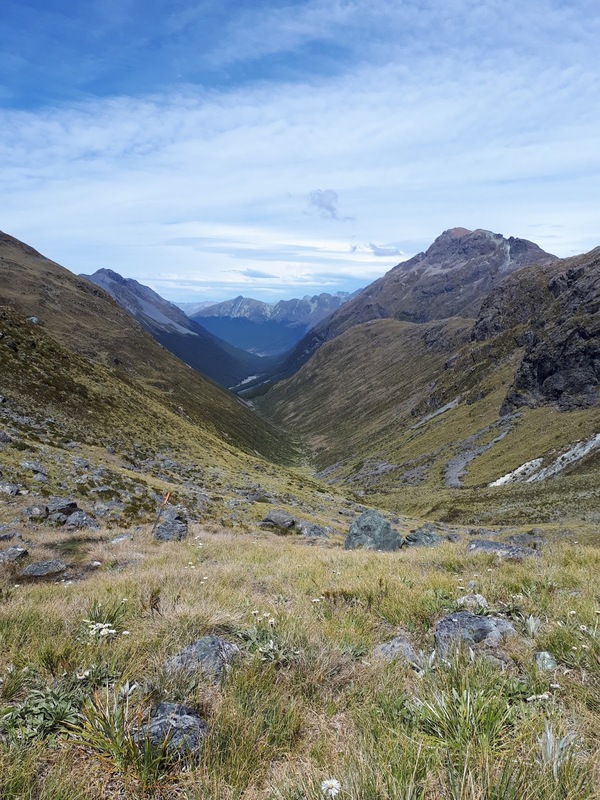 Six kilometres away, at the end of river flats, the bright speck of Steele Creek Hut was just visible. The way down was again marked with warratahs and only a faint ground trail, although that became more defined as tussock gave way too low scrub. The going was easy until around the 1150m contour, where the scrub got thicker. Route finding simply became finding the path of slightly less resistance. That said, as far as scrub goes it was pretty light and not onerous. Entering into the beech forest at the foot of Tongue Spur provided welcome shade and a clear track. The final 2km down the extensive gravel flats were straight forward; simply keep walking in a straight line. A large cairn marked the southern end of the flats, and a couple of minutes later an orange marker pointed up the river bank to the hut. 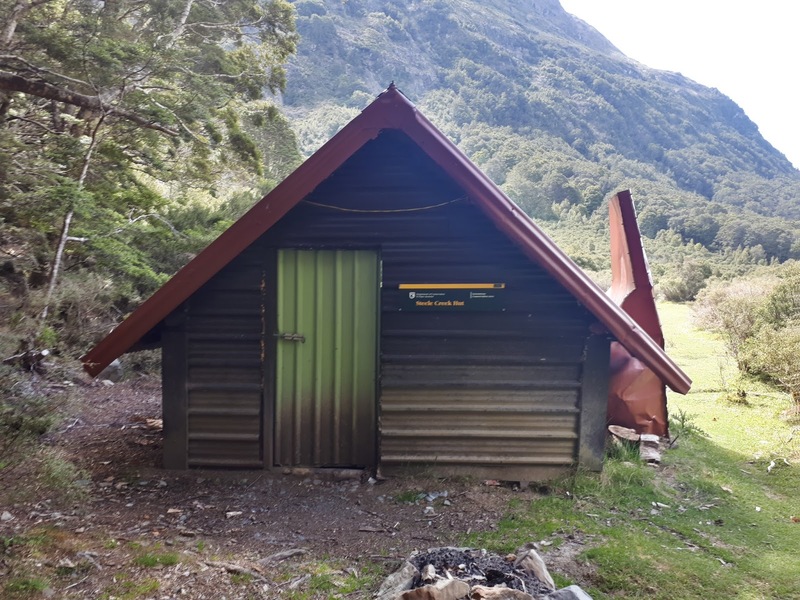 Steele Creek Hut is an historic hut which was restored several years ago by the Deerstalkers association and DOC. The framing is beech saplings, with iron cladding and a dirt floor. Thankfully the upgrades included new beds, so no sacking bunks tonight. Was it a shortcut? No (unless you define 'shortcut' as the longest time between two points), but it sure was far more interesting. Steele Creek is simply a good old tramping route requiring basic routefinding skills and a reasonable level of fitness. Its difficulty gets talked up because it is surrounded by well-defined, well maintained tracks which are achievable for Joe Bloggs off High Street. For the average punter on the Greenstone Caples circuit, yes, Steele Creek would be well out of their depth. But for me? I couldn't have enjoyed it more!